It is very important to send the tick for testing. While treatment decisions should not be based solely upon the results, the information can only help. While labs claim that tests are 100% accurate, what they are saying is that if they find the organism’s DNA, it is definitely present. But we don’t know exactly how good they are at finding the DNA. Some think they are 60-70% accurate; some think more so. We just don’t have that data. Compared to waiting to get ill, and dealing with tests with a 40-50% accuracy, I think it can only help to test the tick. 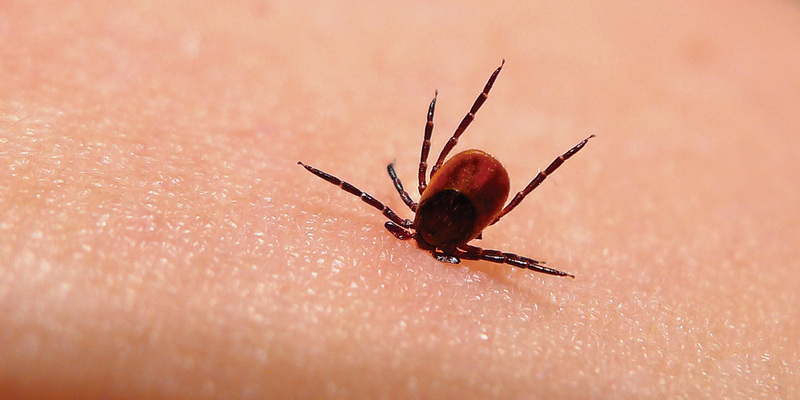 At the moment, testing for tick infections in humans is less accurate than testing the tick. Some labs state testing ticks for the presence of infective agents is 98% accurate. So, if you see the tick, get the tick. There are a number of labs to choose from. I’ve made a list of several well-respected labs, their prices and what they test for, as of today. Decide in advance which lab you want to use, so you don’t have to spend time researching after being bitten. Choosing a Lab: What do they look for? All Labs are Not Equal! Labs which test for Borrelia miyamotoi: Igenex, UMass, and UConn. 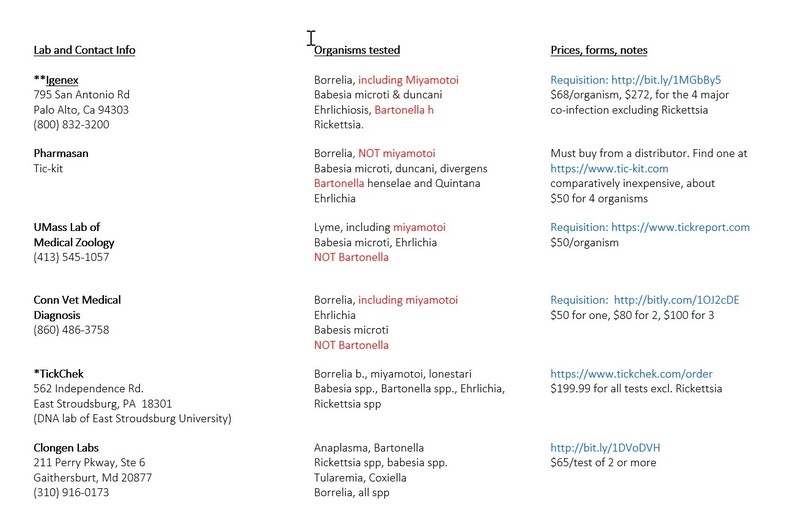 Labs which look for Bartonella: Igenex and Pharmasan Tic-Kit. The Cost/Benefit of These Labs? If cost is not an issue, Igenex is the most thorough lab. In fact, considering how costly it is to get ill, Igenex is a good choice for the economically minded also, even with a significant up-front charge. 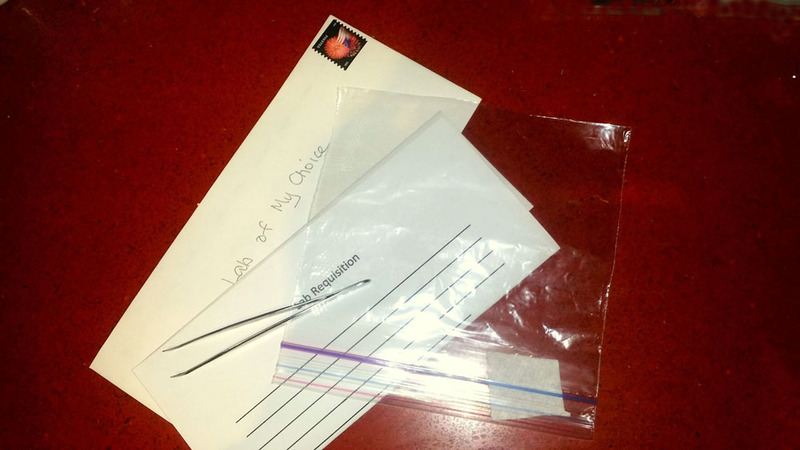 Find your handy DIY Tick Kit containing your fine-nosed tweezers! Correctly remove the tick. Put the tick in the baggy with a slightly moist small piece of paper towel. If you must delay mailing it, refrigerate the baggy. Send even the most mushed up or tiny ticks to the lab of your choice. If you use your DIY Tick Kit, you have done your best to protect yourself after the bite, and before consulting your physician. You’ve been bitten by a tick, and the earlier treatment is begun the better. 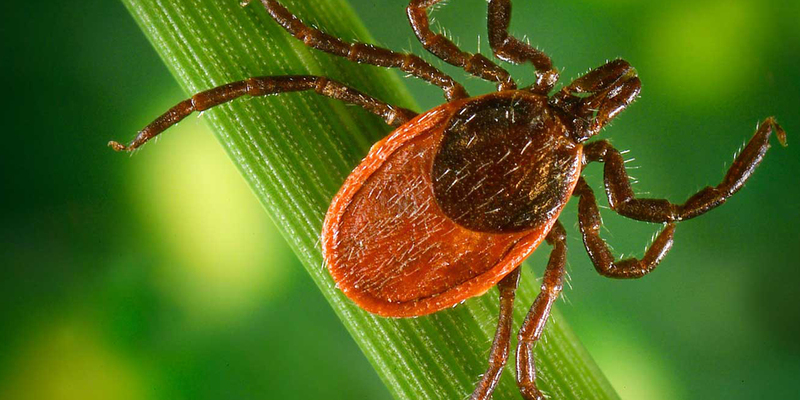 Here at LymeCareNow, we will do our best to see you within 24 hours of your tick bite to provide prophylactic antibiotics, and assist with sending your tick to the appropriate lab. 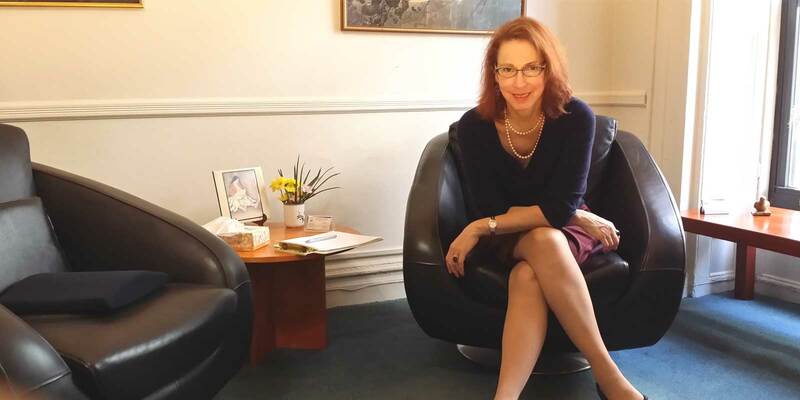 Call for an appointment: (212) 228-2332.